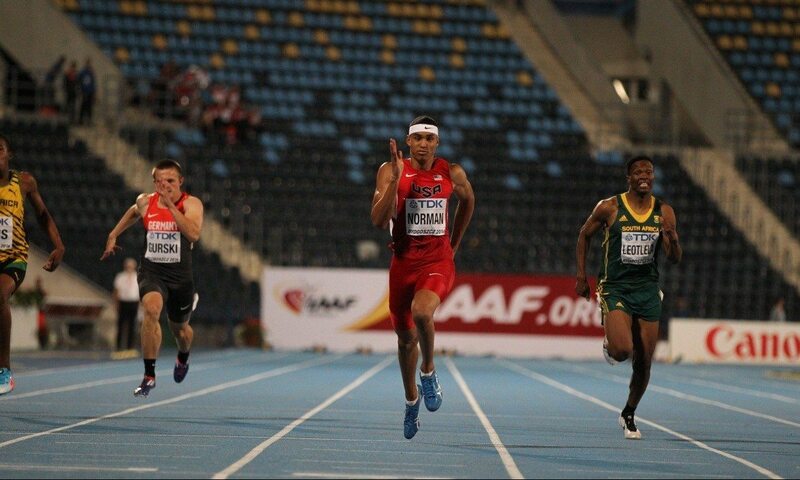 Michael Norman sprinted to a championship best in the 200m of 20.17 to close the fourth day of the IAAF World U20 Championships in Bydgoszcz. The 18-year-old was three hundredths outside the PB with which he was fifth at the recent US Olympic trials as he finished well clear of runner-up Tlotliso Leotlela (20.59) of South Africa, who took silver. Jamaica’s Nigel Ellis was the bronze medallist with 20.63. Britain’s Cameron Tindle, who had set a PB of 20.71 to make the final, was seventh with 20.82. Sarah Lagger came from behind in the heptathlon to take gold with an Austrian junior record of 5960. Still more than a month away from her 17th birthday, she set PBs in the 100m hurdles (14.25), shot put (13.09m) and javelin (43.65m). Cuba’s Adrianna Rodrizuez had led by 64 points going into the last event, but with a two-lap PB that was more than 11 seconds slower than that of her main rival, she was always going to struggle to top the podium. She ended up taking silver with 5925, while Belgium’s Hanne Maudens was third with 5881. Qatar’s Abdalelah Haroun became one of the world’s fastest ever juniors last year when he ran 44.27 so it was no surprise that he took gold in the 400m here. Clocking 44.81, he held off American Wilbert London, who ran 45.27 for silver, while Botswana’s Karobo Sibanda was third with 45.45. Celliphine Chespot set a championship record to win the 3000m steeplechase, the Kenyan clocking 9:25.15 to beat Bahrain’s Tigist Getnet (9:34.08) into second, while Ethiopia’s Agrie Belachew took bronze (9:37.17). Anna Cockrell of the United States won the 400m hurdles with a PB of 55.20, finishing more than a second clear of Jamaica’s Shannon Kalawan (56.54). Rio-bound Sydney McLaughlin is the only junior to have run quicker this year. Bence Halasz of Hungary took gold in the hammer with a best mark of 80.93m (6kg implement). Ukraine’s Hlib Piskunov took silver with a PB of 79.58m. Cuba’s Luis Zayas took high jump gold with a best leap of 2.27m. He had a perfect record up to that point as American runner-up Darius Carbin secured silver with a best of 2.25m. Tom Gale, who was one of few Brits in action during the session, equalled his PB of 2.18m but finished down in ninth. In the long jump, France’s Yanis David took gold with 6.42m – just two centimetres better than that of Germany’s silver medallist Sophie Weissenberg. Great Britain’s women dropped the baton in the 4x100m heats. The quartet was Hannah Brier, Charlotte McLennaghan, Finette Agyapong and Megan Marrs. The male equivalents in the form of Zanson Plummer, Oliver Bromby, Ryan Gorman and Gerald Matthew safely progressed from their heats, clocking 39.91 to win the first semi. In the 400m hurdles semi-finals, Jamaica’s defending champion Jameel Hyde was the only sub-50-second runner as he ran 49.77. Britain’s duo in the women’s 200m semi-finals had mixed results after their relay mishap, Agyapong squeezing through to the final as a fastest loser with 23.64 but McLennaghan going out as she was timed at 23.87. This morning several GB athletes were among those progressing through the first rounds. Harry Hughes, with 74.30m, and James Whiteaker, with a PB 72.51m, went through to the javelin final from a high-standard group stage in which 14 made the automatic qualification. European junior champion Bobby Clay made it through safely to the final of the 1500m. She ran 4:15.79 to be among the four going through automatically, while Harriet Knowles-Jones was a fastest loser with 4:21.91. Both Brits set PB as they went through to the 100m hurdles semi-finals. Melissa Courtney went to fourth on the UK all-time list with 13.28 to follow Alicia Barrett (13.35) in progressing. American Tia Jones was the quickest with 13.04. Britain’s Daniel Rowden made it through the heats of the 800m automatically, clocking 1:50.60 for fourth in his heat.